Egg Curry made in the Instant Pot or Pressure Cooker (video). Egg curry made by adding boiled eggs to a spicy curry sauce, along with coconut milk to balance the flavors. 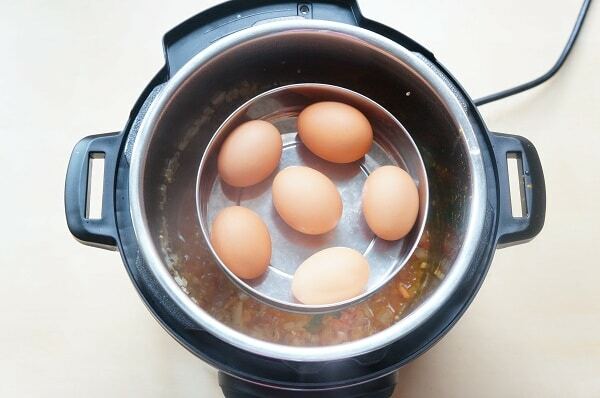 In this Instant Pot Egg Curry, we will make the curry sauce and boil the eggs together, saving precious time. Make this quick and delicious Egg Curry for dinner on busy days in under 30 minutes. Serve it with roti, naan or rice. Low carb and gluten free. If you have meal prepped and have onion tomato masala ready, you can certainly use it in this egg curry. 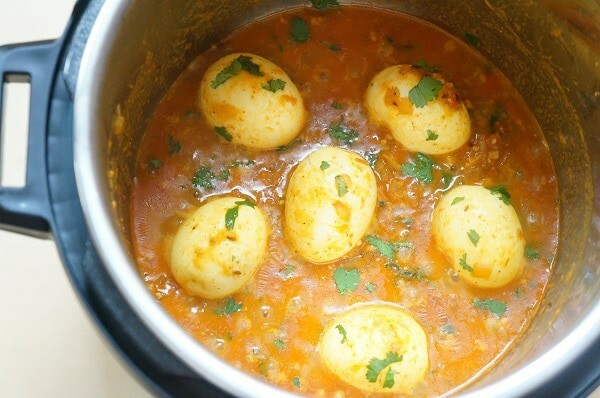 You can also pre-boil the eggs and then this egg curry would take just 5 mins to be ready. If you love eggs, you will enjoy this Guacamole Deviled Eggs recipe using eggs boiled in the instant pot. 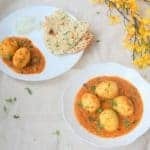 How to make Egg Curry in the Instant Pot? Boiling eggs in the Instant Pot is my favorite thing! Really, I am not joking…the skin slides off so easily that you will never want to cook eggs any other way. 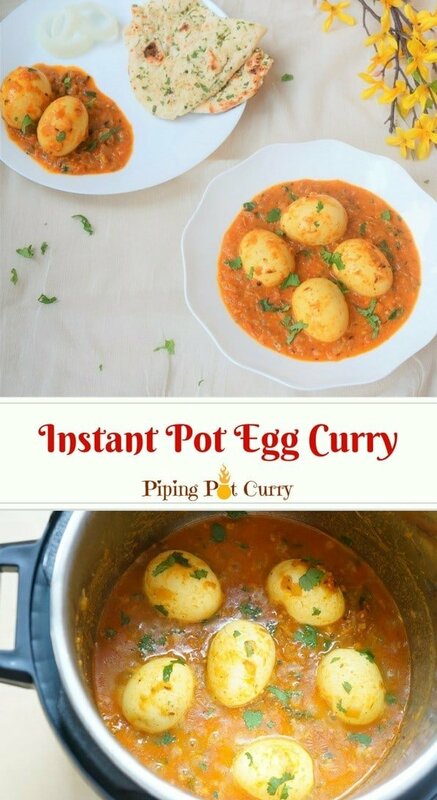 For this egg curry, we will harness the power of the Instant Pot with pot-in-pot cooking – Make the curry sauce and boil the eggs at the same time. Add in the ingredients to make a simple curry sauce – onions, tomato, ginger, garlic and spices. Place a trivet and steel bowl along with the eggs. Cook at high pressure for 6 minutes, followed by a quick release. Carefully take out the eggs and place in an ice bath. Let them cool and peel them. Make holes on the egg surface using a fork. This helps for the curry flavors to infuse into the egg. Some people prefer to fry the eggs lightly in oil before adding to egg curry. I am just lazy and add them without frying. If you would like to fry, add 1-2 tablespoon of oil in a heated pan on stovetop. Place the peeled eggs and lightly fry them on all sides while stirring frequently. If you like a smooth egg curry, then you can use an immersion blender to smooth the curry sauce. If doing this, place the whole spices in a spice pouch so you can easily remove them before using the immersion blender. We enjoyed the curry as is and did not blend it. Add in the coconut milk and some water, along with the peeled boiled eggs to the pot. Cook the sauce along with the eggs for a few minutes on saute mode, so the flavors of the sauce seep into the eggs. Garnish and enjoy with rice or naan. Now, let’s talk about different variations of Egg Curry! North Indian Punjabi Egg Curry: Curry sauce is made with onion, tomato, ginger garlic and smoothed using immersion blender. South Indian Egg Curry: This is what we made, along with coconut milk. Some variations suggest to add tamarind paste to give a tangy flavor to the egg curry. Add heavy whipping cream in place of coconut milk. Make it lighter: Add milk in place of coconut milk. Stir while adding little at a time. Try out this delicious egg curry or one of the variations. Do let us know how it turned out! Looking for more easy Instant Pot Indian Recipes? Here are 23 Best Instant Pot Indian Recipes for you to try! Egg curry made by adding boiled eggs to a curry sauce, along with coconut milk to give a flavorful protein-rich dish. 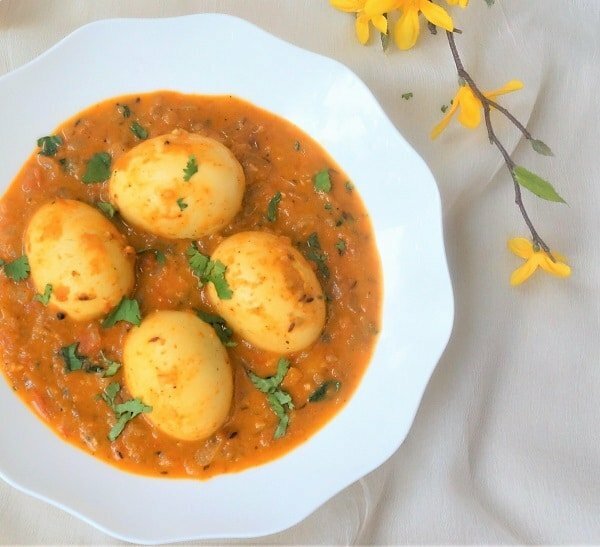 In this Instant Pot Egg Curry, we will make the curry sauce and boil the eggs together, to make this delicious dish even quicker! Pair it with rice, naan or roti to make a complete meal. Start the Instant Pot in Saute (More) mode (Press Saute, then Adjust). Once the display reads HOT, add oil, whole spices and cumin seeds. When the cumin seeds change color, add green chili, onions, ginger and garlic. Sauté for 3 minutes. Add tomato and spices. Stir and let it cook for 2 minutes. Stir in 1/3 cup water and scrape off anything stuck to the bottom of the pot. Place the trivet and a steel bowl with eggs in it. Close lid with vent in sealing position. Change the instant pot setting to manual or pressure cook mode at high pressure for 6 mins. After the instant pot beeps, quick release the pressure. Carefully remove the bowl with eggs and the trivet. Place eggs in ice cold water and then peel them. Make holes in the egg surface using a fork. Add coconut milk and 1/3 cup water. Add back the peeled eggs to the pot. Change instant pot to Saute mode and let the curry simmer for about 3 minutes while stirring frequently. Then turn off instant pot. Add lemon juice and garnish with cilantro. Enjoy Egg Curry with rice, roti or naan. Punjabi Egg Curry Variation: If you like, you can skip coconut milk and add more water. Coconut milk can also be substituted with heavy whipping cream. Smooth Sauce: You can skip whole spices or add them to a spice pouch. If you like you can use an immersion blender to get a smooth gravy. Make sure to remove the spice pouch before blending. Fried Eggs: If you like, you can lightly fry the eggs in oil in a pan on stovetop before adding to the curry. Pairing: Enjoy this Egg Curry with Basmati Rice, Quinoa, Roti or Naan. Heat oil in a medium-sized pan, and add whole spices along with cumin seeds. Let them sizzle for 10-15 seconds. Add green chili, garlic, ginger, and onions. Saute till the onions turn soft and translucent while stirring occasionally (about 5-7 minutes). Add tomatoes and spices. Continue frying them till they are soft and mushy, and oil begins to leave the sides (about 5-7 minutes). Add coconut milk and water. Mix well and lower the heat to medium-low. Let it simmer for 2-3 minutes. Place the eggs in the pan and cover it with the gravy. Let it simmer for another 5 minutes. Take it off heat and serve hot sprinkled with coriander. WOW an amazing dish! Finger licking good! I just put my eggs on the trivet at the very beginning and boiled them and then added them to the curry later to absorb flavor while the curry was under high pressure. Worked really well for me since i don’t have a steel colander for steaming. Hey Diana – So glad you enjoyed the Egg Curry. Thank you for sharing back! I am planning on trying this recipe tonight. Do I need to add any water in the container with the eggs? Hey Neema – You don’t have to add any water with the eggs. There is liquid in the curry which helps the eggs to cook. Hope you enjoy the egg curry! My eggs didn’t cook all the way through. I didn’t have a flat bowl, so is that why? Would you recommend something else if we don’t have a flat option? Hey Rachel – Sorry to hear. I am curious if you used a steel bowl or a glass bowl for the eggs? I ask as in glass bowls, it usually takes 2-3 minutes longer to cook. I don’t think flat bowl or not would make a difference. Meeta, Thank you for the recipe, it really tasted good. Only thing was do I need to release the steam immediately after 6-7 minutes of Pressure cook? or can I wait few more mins. I noticed that the onion and tomato were not gel together, could it have been something to do with Onion not cut thinly sliced or was it because I didn’t cook enough. A confession – I am new to this whole Indian cooking scene. If u double the recipe do u double the egg cook time? Hey Swati – The cooking time will remain the same, even if you double the quantity. Hope you enjoy it! Hey Kiara – Thank you for trying so many of my recipes and sharing your feedback. I am glad you are enjoying them!